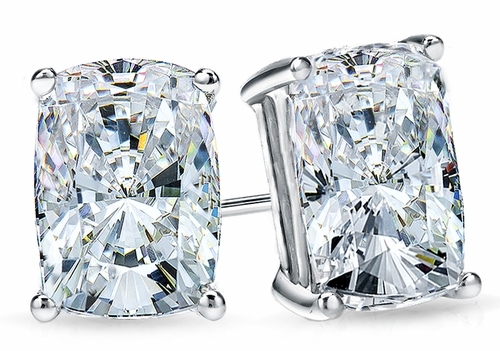 The Elongated Cushion Cut Cubic Zirconia Stud Earrings are classic in design and set in a traditional four prong basket style setting. 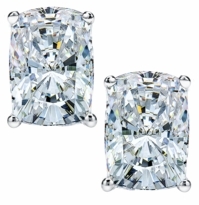 This premier shape with its exclusive cut features the perfect combination of a cushion cut simulated diamond cubic zirconia in an oval or emerald rectangular shape. This hybrid cut has soft edges that beautifully highlight the antique style of the cushion cut in an elongated or oval fashion and can also be referred to as a cushion cut rectangle, antique cushion cut, oval cushion cut, hybrid cushion cut or emerald cushion cut. The lab created laboratory grown elongated cushion cut simulated diamond cubic zirconia stone is hand cut and hand polished by diamond cutters utilizing the original Russian formula cubic zirconia in the radiant cut faceting pattern. 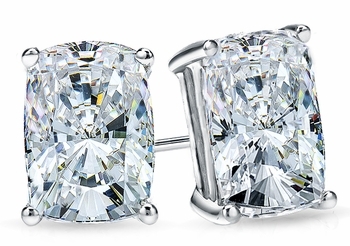 Our diamond quality Elongated Cushion Cut Stud Earrings include standard push backs and the options of screw backs and large backs are available. These stud earrings are set in 14k yellow gold or 14k white gold and are also available in 18k solid gold or luxurious platinum. Various center stone color options include canary yellow simulated diamond, simulated pink diamond and ruby red, sapphire blue and emerald green man made gems, please see the pull down menu for options. For further assistance or special order quotes, please call us toll free at 1-866-942-6663 for pricing or visit us via live chat and speak with a live representative. This is a special order item and is made to order.